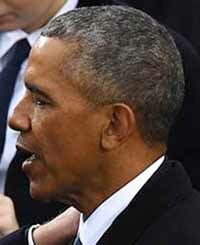 US President Donald Trump today slammed his predecessor Barack Obama for being "impotent" and not stopping China from expanding its influence in the South China Sea, saying the Chinese Navy was now posing a confrontational challenge for America in the disputed region. President Trump's remarks came hours after he was briefed at the White House by Secretary of State Mike Pompeo on his meetings with the top Chinese leadership in Beijing this week. "The Obama administration was impotent about the South China Sea," Donald Trump said during an interaction with reporters abroad Air Force One. During Mike Pompeo's visit, Donald Trump earlier told reporters at the White House that China was sending a message to him, but those messages did not work. He said Mike Pompeo was treated with great respect during his trip to Beijing. "They're just trying to get me a message. But those messages don't work. They don't work. But no, I think they treated him with great respect, actually. You know, they had meetings besides just the news conference. And I think they treated him with great respect," he said when asked if he was concerned the way the Chinese treated Mr Pompeo.